How would you like an extra $2,000 every year to spend on your disaster preparedness plan? You can free up more money than that by using a vacuum sealer. These relatively inexpensive and versatile machines remove excess air from packages. They are simple and easy to use. And according to the manufacturers of vacuum sealers, as well as the preppers that use them, you can save as much as $2,700 a year when you put one of these handy little items to work for your family. Think about it. Exposure to air (predominantly oxygen) is what speeds up the decaying process in foods. When you purchase bulk food items on sale, you save money. When you combine those savings with the fact that vacuum sealing can extend the life of food by up to 500%, you virtually eliminate waste. That means roughly an extra $200 per month back in your pocket. And that could buy a lot of survival gear, or even more food. 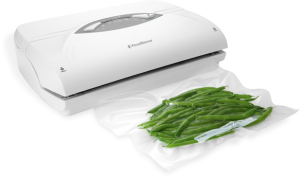 Just make sure you choose a vacuum sealer that has the ability to seal delicate things without crushing them. This feature is usually designated by a specially marked button with the word “pulse” on it. This gives you complete control over how much oxygen you extract from any package. This means never crushing breads, cookies and other soft food items while sealing. But it also keeps your maps, documents and other delicate nonfood items waterproof and safe as well. Vacuum sealing clothing is a great idea too. If you store clothing for the long-term, it will last longer when sealed first. The process also compresses that clothing down to a much smaller size, perfect for optimizing space in your bug out bag or shelter. Vacuum sealed bags can play an important role in water collection after you have removed the contents. And the entire bag can be submerged in hot water, making heating rice, soups and other foods quick and easy. How many times have you heard hikers or campers tell stories of falling and getting all of their gear soaking wet when trying to cross a river or stream? Vacuum sealing your possessions, especially your fire starting kit, means dry retrieval every time. That maximizes travel time, since you are not sitting around waiting on all your gear to dry before you get moving again. You can add oxygen absorbers inside vacuum sealed bags, especially when sealing dried food items, so all the oxygen is extracted. And make sure to purchase a vacuum sealer that allows you to make bags any size you want. You can make ice packs by sealing up ice cubes. Pop them in your cooler, and the ice melts much slower than normal. These also make excellent ice packs for treating sprains. Vacuum sealing systems, handheld and larger, can be had for $50 – $200. Considering the saving estimates mentioned above, and your personal situation, in 1 to 4 months this investment can easily pay for itself. If you are interested in purchasing a vacuum sealer, naturally our first recommendation is to check out the Vacuum Sealers on Amazon. This product has enough general life uses that you don’t have to obtain it from a disaster survival specialty store.